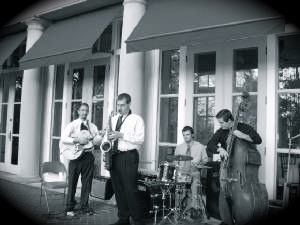 The John Hartmann Group is a hot swinging Jazz group in the St. Louis area. The group has a unique Jazzy sound while still carrying on the standard Jazz tradition. Along with Jazz standards the group also plays Blues, Latin, and Funk. The band consist of a Quartet with John Hartmann on guitar, Aaron Giraudo on sax, Max Kelly on bass, and Jimmy Star on drums. Their collaboration of sound comes together to create a signature sound that is very unique and defining. The John Hartmann Group has been together since 2002 forming at the SIUE jazz program. The John Hartmann Group has played at numerous venues throughout St. Louis including Harrah's Casino, Casino Queen, President's Casino, Ritz Lounge, Ritz Carlton, Hyatt, Chase Park Plaza, Westport Plaza, and the Planetarium. The John Hartmann Group has performed for special events for the Cardinals, Rams, St. Louis local Celebrity Benefit, Clayton Chamber of Commerce, WB 11 News Station, as well as many weddings and private parties. The John Hartmann Group continues to make its name in St. Louis and has become one of the highest demanded jazz bands in St. Louis area by bringing a contemporary approach while maintaining maturity and respect for the timeless traditional jazz sounds.